Even The Economist is reporting on it: tablets & smartphones have taken over and they’re changing the way people use the web & buy online, but it’s surprising how many organisations have yet to make the changes necessary to take advantage of this change. Does your web strategy include mobile? Research firm Gartner recently reported that Desktop PC shipments declined a further 8.3% in Q3 2013, making this the sixth consecutive quarter of declining worldwide PC shipments and it’s no longer just the consumer market that’s driving that decline. 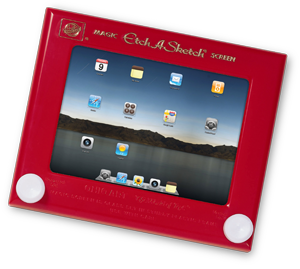 Tablet sales have been on the increase since they became available in 2010, up to around 34% ownership (in the US) by may 2013 according to Pew Research’s statistics. Modern Laptops & Desktops are incredibly powerful so there’s less need to upgrade every couple of years. The chances are that a well-maintained, three or four year old computer is perfectly sufficient for most consumers’ needs, so they are opting to add a tablet to their collection instead of upgrade their home’s desktop or laptop PC. Tablets & Smartphones are convenient. Sure, a tablet or smartphone can’t do half the stuff a full desktop computer can but, when you’re watching telly & just want to Google the answer to a question on University challenge, they win every time. Plus you can’t take a desktop PC into the toilet. Google, Microsoft & Apple have all been trying to get their make their operating systems more corporate-friendly, with varying degrees of success, but a general, upward trend. Increasingly we’re seeing Tablets in the workplace, not so much replacing the desktop PC as augmenting or adding to it. Pew Research & Shareaholic also confirmed our own anecdotal evidence that websites that perform poorly on mobile result in lower conversion rates and higher bounce rates, i.e.If your site isn;t optimised for their device, visitors will leave your site without doing what you wanted them to. Even when it comes to email, conversion rates increase if they are optimised for mobile, although there is some debate about the skewing effect of accidental clicks triggered when reading un-optimised emails on mobiles. 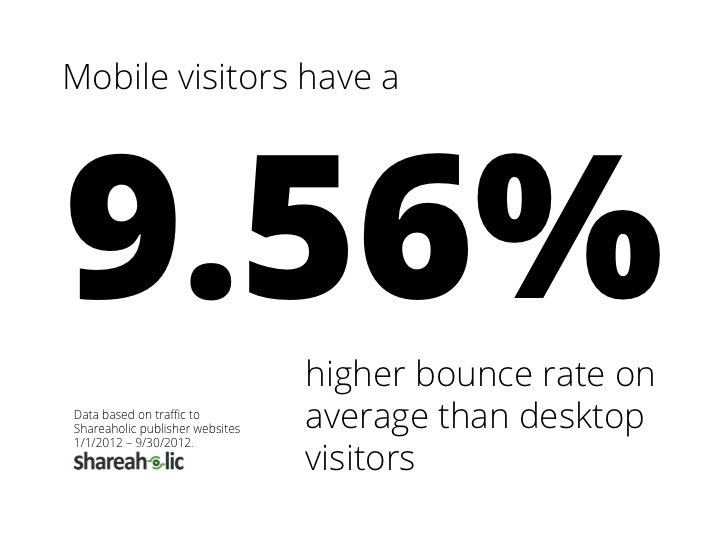 Research by Shareaholic puts the mobile bounce rate for un-optimised sites at nearly 10% higher than the bounce rate for desktops. According to 2013 research at MobiThinking, There are 45.8 million smartphones in use in the UK, and 22% of those smartphone users have it as the primary device to access the web. How much of any particular site’s traffic comes from handheld devices varies massively according to its audience but one thing is for sure, it’s already passed the point of ignoring it. Some of our consumer-focussed clients currently see as much as 60% of visitors on handheld devices while others, particularly B2B & corporate services, can be as low as 12%. There isn’t one rule for everyone so it’s more important than ever to understand your audience and their needs. It’s hard to understand the speed at which this change as occurred, so these recent figures from YouTube should help provide a little context. 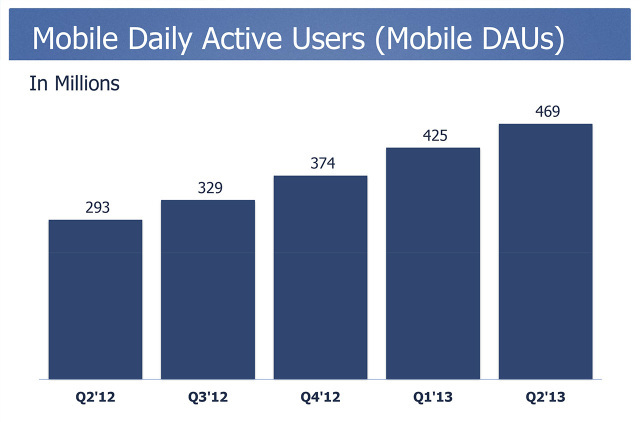 Facebook’s stats show a similar growth in mobile usage in the 12 months to Q2 2013, with a 469million out of a total 699million Daily Active Users (DAU) accessing the service via mobile. So, mobile/handheld is the big thing but what’s the right journey for your organisation? Is responsive or adaptive the right way to go, or maybe a mobile-specific site or an app? Should your email be optimised for mobile devices? Well, there’s no easy answer; It all comes down to matching your organisation’s objectives with the needs and expectations of your audience.